There is no getting around it. Household chores can be a pain. We dread doing them, but know that if we don’t do it, our house and our pocketbooks will suffer for it later. Why Gutter Cleaning Is So Important? For gutters to work properly, you need to keep them and the downspouts clear of leaves and debris and this takes regular maintenance. Either you have to climb the ladder and do it yourself or you need to hire a professional gutter cleaning company to do it for you. The rule of thumb is to clean your gutters at least twice a year, but more if you have a lot of trees hanging over your house or you live in an area that experiences a lot of storms. If you have any concerns about safely climbing up and down the ladder, then your safest bet is to hire a professional cleaning company. If you are going to do it yourself, make sure you have a sturdy ladder and never ever stand on the top two rungs. A leaf blower or a hose is a quick and easy way to clean out your gutters, but make sure you wear goggles and a dust mask and heavy work gloves. You can also purchase a gutter cleaning kit that can connect to your leaf blower. Another option is to use a garden trowel or gutter scoop to clean it out by hand. For best results, start at the drain outlet near the low end of the gutter. Then just dump into a bucket to dispose of when you are all done. It is best to do it when the leaves are only slightly damp not real soggy. Besides focusing on what is just in the gutters, also make sure to use the leaf blower to blow any leaves or debris off the roof itself so it doesn’t all end up in the gutters the next time it rains. There are different gutter guards and leaf-catchers that can help make maintaining your gutter system a lot easier. But be careful when choosing one because, debris can still settle through them and many of these products are not cheap. If you do decide to get one, make sure it can be easily removed for cleaning. Another product that can make maintaining your gutter system easier is TheSpoutOff. It is especially helpful if you have small rain gutter outlets because TheSpoutoff outlets are designed with a larger opening allowing for water to still run down even if other parts of the gutter are clogged. Another great plus is that these outlets are easy to keep clean through the removable downspout that allows you to check on the outlets without having to climb a ladder. With TheSpoutOff, a fear of heights or balance concerns will no longer keep you from properly taking care of your home and it is a lot cheaper than hiring a professional cleaner to come regularly to clear out all the debris. The SpoutOff can be retrofitted to your current gutter system or it can be added to a new one, depending upon your needs. The instructions are relatively easy to follow so it is something you can easily install yourself, but any local gutter company can do it for you as well. 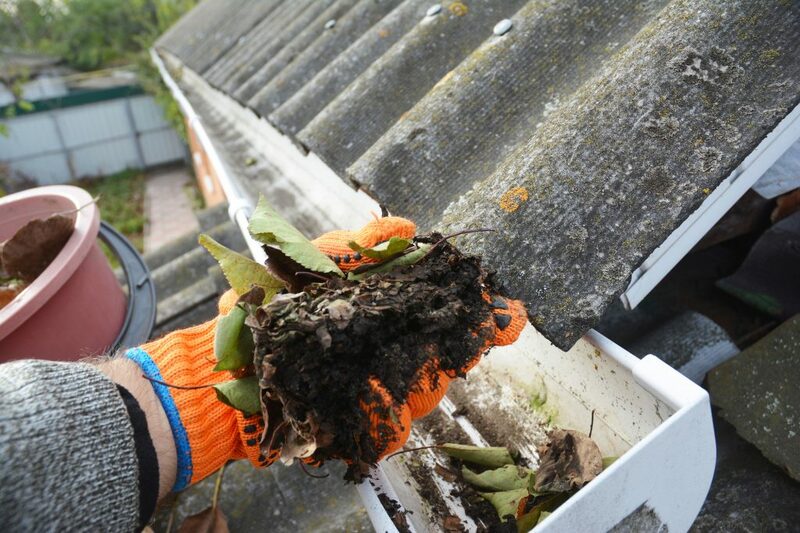 Once The SpoutOff is installed, you won’t need to buy any special tools to use to clean the gutters. A once dreaded chore can become so easy. If the weather is calling for a bad storm and you are worried about your gutters now it will be so easy to check on them. It will only take a few minutes and you can do it safely from the ground. As long as The SpoutOff outlets are free from debris, your gutter system will work properly even if other parts of the system are clogged. The SpoutOff comes with a large outlet and removable downspout clip that can either be installed with new gutters or retrofitted to the gutter system you already have. The SpoutOff can be installed onto 5 inch and 6 inch K-Style gutters with either 2 inch x 3 inch or 3 inch x 4 inch downspouts, but 3 x 4 downspouts are recommended. The SpoutOff components are designed to work with most downspout configurations including A Elbow, B Elbow and Underground Pipes. You can even install it into an underground pipe. The SpoutOff components are powder coated aluminum so you can easily paint them or have a professional painting company do it for you. You can still use covers and shields on your gutters even with The SpoutOff. The Quality of Your Gutter System Counts Too. Besides The SpoutOff, the type of gutters you have installed matters too. If they are not durable enough or not installed properly, the whole system will be more prone to damage and leaks. If you are going the DIY route than vinyl gutter systems are the most popular and easily found at any local home improvement store. If you’d like the gutters to be a particular color than aluminum gutters are your best bet because they can come in over 25 different colors. You can find most types of gutters for sale at your local home improvement store. Avoid hanging the gutter hangers too far apart. The gutter hangers are the way you mount the gutter system to your home so they need to be spaced properly. If you leave too much space between the hangers, the rain gutters will actually sage causing the water to pool instead of flowing through. If this keeps happening and you have a lot of water pooling in different sections of the gutter system, the extra pressure is going to make the system separate from your home. The rule of thumb is to place the gutter hangers about every three feet or so, unless where you live there is a lot of snow and ice, then every 2 feet is better.